A nation will rise no higher than the strength of its homes. If you want to reform a nation, you begin with families, with parents who teach their children principles and values that are positive and affirmative and will lead them to worthwhile endeavors. It is this reason that The Church of Jesus Christ and other religious faiths are joining forces to defend the family as well as to help strengthen the traditional family in many nations that are struggling to survive. If a nation will rise no higher than the strength of its homes, then we need to help those in impoverished nations improve their homes—so they can improve their nation. It is, of course, only one area of focus to help a country. But we can’t underestimate its vital role in the process of building a nation. Individual progression is fostered in the family, which is “central to the Creator’s plan for the eternal destiny of His children.” The home is to be God’s laboratory of love and service. There a husband is to love his wife, a wife is to love her husband, and parents and children are to love one another. The family is ordained of God. Marriage between man and woman is essential to His eternal plan. Children are entitled to birth within the bonds of matrimony, and to be reared by a father and a mother who honor marital vows with complete fidelity. … By divine design, fathers are to preside over their families in love and righteousness and are responsible to provide the necessities of life and protection for their families. Mothers are primarily responsible for the nurture of their children. In these sacred responsibilities, fathers and mothers are obligated to help one another as equal partners. Children are the past, the present, and the future all blended into one. They are consummately precious. Every time a child is born, the world is renewed in innocence…. Parents are responsible to provide for their children…. We are to look after their physical, their spiritual, and their emotional needs. … Nothing compares with a father who is responsible and in turn teaches his children responsibility. Nothing compares with a mother who is present with them to comfort them and give them assurance. Love, protection, and tenderness are all of consummate worth. When it comes to understanding our relationship with our Heavenly Father, the things my wife and I have learned as parents and grandparents that are of most worth knowing, we have learned from our children. As a child, it’s difficult to comprehend the love that our parents have for us. But as we become mothers and fathers, we gain a greater appreciation for that unconditional love. And, as Elder Packer said, we gain deeper insight into the relationship we have with our Father in Heaven. Families serve a divine purpose here on earth. Marriage was intended by the Lord to endure beyond physical death. 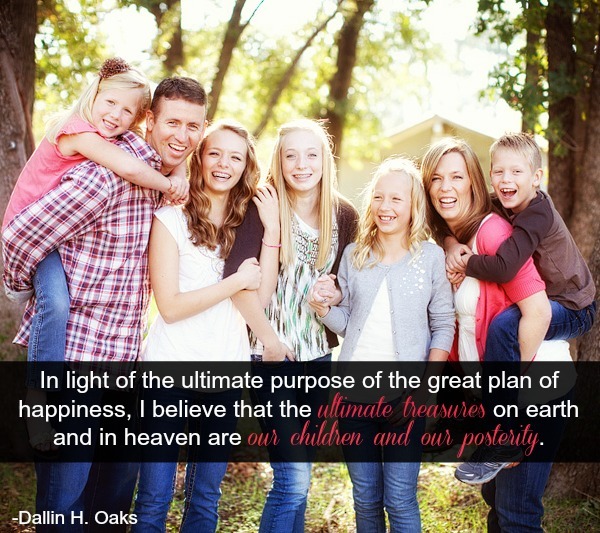 His plan offers eternal perpetuation of the family in the kingdom of God. His plan provides temples and opportunities to officiate therein for the living and the dead. A marriage sealed there launches a husband and wife into that grand order of unity so necessary to the perfection of God’s work. A husband and wife, sealed in the holy temple, are bound together for eternity. Any children born into the union are also bound to them. If the couple already has children, these children can be sealed to them in the temple. It is a powerful bond that will remain in force after death. We are anxiously about the task of searching out our fathers and mothers of generations past and binding them to us and us to them. Is not this the strongest possible evidence of our conviction that Jesus Christ will come again to reign upon the earth? We know He will, and we know what He expects we will have done in preparation for His return. When I think of the love I feel for each member of our family, I sense, to a slight degree, the love that our Heavenly Father bears for His children. … God’s love for His children is infinite. Regardless of race, nationality, or gender, He loves all of them. … Every human being who comes to this earth is the product of generations of parents. We have a natural yearning to connect with our ancestors. This desire dwells in our hearts, regardless of age.… When our hearts turn to our ancestors, something changes inside us. We feel part of something greater than ourselves. Our inborn yearnings for family connections are fulfilled when we are linked to our ancestors through sacred ordinances of the temple. The subject of marriage is debated across the world, where various arrangements exist for conjugal living. My purpose in speaking out on this topic is to declare, as an Apostle of the Lord, that marriage between a man and a woman is sacred—it is ordained of God. I also assert the virtue of a temple marriage. It is the highest and most enduring type of marriage that our Creator can offer to His children. … The noblest yearning of the human heart is for a marriage that can endure beyond death. Fidelity to a temple marriage does that. It allows families to be together forever. Throughout the world, the family is increasingly under attack. If families fail, many of our political, economic, and social systems will also fail. And if families fail, their glorious eternal potential cannot be realized. Our Heavenly Father wants husbands and wives to be faithful to each other and to esteem and treat their children as an heritage from the Lord. Our communities and neighborhoods will be safer and stronger as people of all faiths work together to strengthen families. It is important to remember that all larger units of society depend on the smallest and most fundamental unit, the family. No matter who or what we are, we help ourselves when we help families.